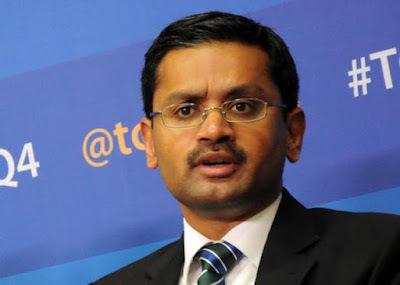 Unfazed by the possible changes to the H1-B visa regime, CEO of India’s IT major TCS Rajesh Gopinathan has said the current discourse on the issue in the US is driven by emotions rather than economy and the best way to tackle it is through greater engagement. Gopinathan favoured a policy of engagement with various stake holders on the issue of H-1B visas in the US. He noted that the discourse is currently driven by emotions rather than economy. “The best way to tackle that is greater engagement. Because the way, sometimes, companies like us get characterised is very different from the reality of what we bring to the table,” Gopinathan said. “Some of these engagements actually help get that message out also. People will understand us better for who we are, and I think engagement, communication and collaboration is the best way to deal with the political lack of understanding which comes. Democracy ought to deal with the emotional response that you see and you have to get over it and engage positively,” Gopinathan said. He said the US has been a “very welcoming market” for the IT major and has provided it with a fair, open and competitive environment. “All said and done, the US has been a very welcoming market for us. So you keep aside the immediate issues, it’s been a market that has been fair, it has been an open, competitive environment,” Gopinathan told the agencies, exuding confidence that TCS would be able to successfully compete in any environment. Gopinathan said TCS has competed and has won against the best in the country. “We have competed and we have won against the global best in this country, on equal footing. So, it has been a market that has helped us grow in confidence as we have gone,” he said but repeatedly refrained from having any complaint from the present system or the possibility of a new executive order that would adversely have an impact on his company’s performance due to any action by the Trump Administration on H-1B visas. US President Donald Trump is set to sign an executive order that would tighten the process of issuing the H-1B visas and seek a review of the system for creating an “entirely new structure” for awarding these visas. Gopinathan was appointed as the new CEO of TCS this January after his predecessor N Chandrasekaran was elevated to the post of Chairman of Tata Sons. Responding to questions on a potential executive order or legislations being talked about lawmakers, Gopinathan asserted that there is no law currently in the US that is discriminatory. “There are many that are being discussed, which if they were to get passed, in their extreme form would be discriminatory. So we should actually give credence to the system here, that is, as I said, it is fair. It has been fair in the past, there is no reason for us to assume that it will not be fair in the future. So, let’s deal with what’s on the ground and let’s go step by step,” he said. “More importantly, we have very active STEM education engagement in the US. We work with colleges, high school students, we reach out, we have touched close to 20,000 plus students already, and significantly we are accelerate that into what we call Ignite My Future Campaign. We just target to touch one million students all in the next five years,” he said. Noting that the technology market is actually under supplied, he said the sheer demand of technical skills far outstrips the supply. “What we’ve been successful in India is to actually increase the world supply, often generating graduates way beyond what the governing systems actually provided. So we capitalised the emergence of a private sector education complex that served to provide us the talent required for our growth,” he said.